1.Design: Fashion children big Pocket Jeans. 5.Features: eco-friendly, sweat-absorbent, cute and fashion. 6.A must have for parents. 7: length: 36cm, hip 28*2cm. 9: length: 38cm, hip 29*2cm. 11: length: 40cm, hip 30*2cm. 13: length: 42cm, hip 31*2cm. 15: length: 45cm, hip 33*2cm. 1. We only ship items to your Aliexpress verified address. 2. Payment must be received within 3 days from the date of the purchase. 3. Please leave a note in Aliexpress when making the payment if you have any special request( colors/size). Orders will be processed instantly and dispatched in same day normally, so we do Not accept any Email/Message note before or after you place orders. Pls kindly check and review the shiping time as it's very important to both of us. 1. This item was located in china which will take 15-30 days to arrive by china post airmail. a. All items are professionally packed for safe delivery. b. Combine transaction will get discount. via EMS, UPS, FEDEX, TNT OR DHL, actually it depends on your location. if you have the special request for the shipment, pls contact us when you placed orders. 2. Small items, item value is under 50usd, if it was not specified by customers or by us, we use China post airmail to ship it which will take 25-30days, if you still not receive the item lasts to 30days, pls contact us, a full refund will be given with No Excuse. 3. Shiping time during holiday will be longer than normal. 1. We appreciate your 5 detailed selling rating (DSR) positive feedback, which will help a lot our business development. 2. In the case that you are not satisfied with our goods and plan to give us a neutral/negative feedback, pls write us immediately so that we can help you out by all means. At last, thanks for your purchase and wish you having a happy shopping! 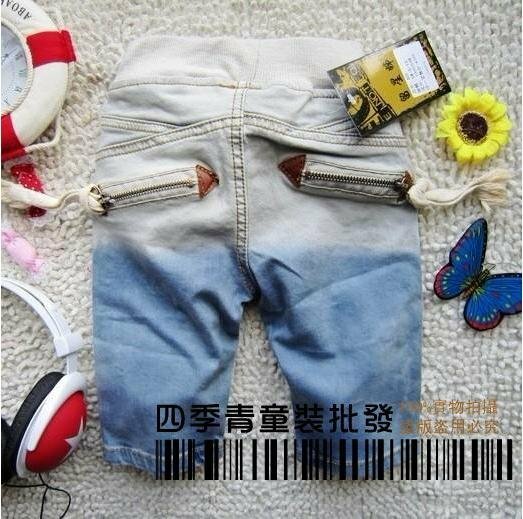 wholesale 5pc/lot free shipping 2012 Han edition, colorful little buttons, children's pants , girls seven points jeans.